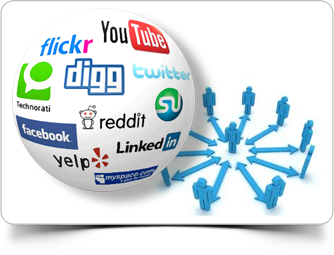 Being sociable is the easiest way to find new customers online. Whatever the message you want to share, social networks like Facebook and Twitter can help your voice be heard by as many people as possible. We can help shape your social media marketing whether it's a branded Twitter profile you need or a YouTube channel to showcase your videos. We'll share the secrets of our past success and make sure you benefit from all our experience. You can't afford to forget Facebook marketing or social media management. They're overtaking traditional methods and Twitter marketing means that satisfied customers won't just tell their friends, they'll tell everyone. So, contact us today and introduce yourself to the world. They're waiting to meet you. Whether you need to create a business page on Facebook or need an app to help drive interest and awareness, our professional web design skills can do the job. We'll help your business stand out from the Facebook crowd and use our experience to recommend tactics that work. Twitter is a great way to tell the world you've arrived. Whether you're updating your product lines, running a campaign or just want to engage in a deeper relationship with your customers, Twitter can help get the digital conversation underway, and we'll use our skills to make sure everything's fully optimised too. These days, customers expect the brands they trust to talk to them like individuals. They want to be kept informed and given valuable information. Whether you want to have one big conversation or lots of them and whether you want to do it via your website or on social networks, we can help put you in closer touch with your clients. It's good to talk. Businesses who blog reap the reward in more clients, more sales and longer, deeper client relationships. We can help you get your blog up and running, share the secrets of success and even organise writing the content if that's what you need. We spend all day experimenting with websites so we know what works when it comes to content. We'll offer tips about how to present your business, how to keep things fresh and engaging and how to showcase it all with the best web design techniques and, once again, if you're pushed for time we can even create the content itself. You'll find many so called experts who promise the world when it comes to seo. They usually disappear after all the hot air. We don't. We're in it for the long term so we'll be honest about what to expect, only recommend tactics that are proven to work and keep you fully updated about how things are performing. Good decision making relies on good data. Our analytics service pulls all of the key metrics your business needs to track into one, easy to interpret, regular report. We'll keep an eye on things too and if the analysis picks up a problem or opportunity, we'll be straight on the phone to offer advice. It seems right now that the world can't get enough of social networks. If you're struggling to tell the difference between Facebook and Twitter or don't know how to get the most from LinkedIn, relax. We'll cut through the hype and help you design solid social media campaigns for whichever networks work best for you and your customers.